If you’re looking for a reasonably priced home automation system that is easy to set up, SmartThings is a system worth considering. 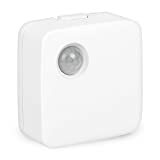 It connects to ZigBee, Z-Wave, IFTTT, and other Wi-Fi enabled devices, so you can automate your lights, doors, outlets, and more while you’re away from your home. Because of its wide range of equipment, stellar customer service, and reasonable pricing, SmartThings is our top pick for best home automation system. Read on to find out why it earned high marks. Summary : Customers rave about the SmartThings customer service team and its community support. It has a broad range of equipment options, and its pricing is reasonable. Where SmartThings lacks is in its interconnectivity—it’s compatible with only about 100 products, whereas competitors are compatible with up to 1,000 products. 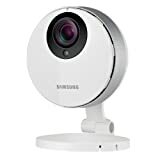 How does Samsung’s SmartThings work? Before we get into the details of the pros and cons of SmartThings, we want to make sure you know what this system can do for you. This video gives you a peek at how you could use SmartThings in your life, whether it’s telling you the weather, adjusting the lights, turning your coffee pot on, locking your doors, or notifying you when someone returns home. Check out the video below to see more. Every SmartThings system requires the app and Hub, which is the same with Insteon, WeMo, Philips Hue, and Wink. The app is free and the Hub costs $99, so make sure you have a smartphone or tablet and factor in the price of the Hub when selecting your equipment. SmartThings integrates with many other devices including Bose, Honeywell, Leviton, Google Home, Ring, and many more. This allows you to expand your SmartThings system to help you automate multiple items in your life. Don’t worry about a limit to the number of devices you can connect to your Hub. You can connect up to 231 Z-Wave devices and hundreds of ZigBee devices, but you may need a wireless repeater to help with signal strength. If you do meet that limit, you can always purchase a second Hub and expand your system that way. SmartThings partnered with Scout Alarm, one of our top picks for best home security system, to provide professional monitoring to your SmartThings account. When an unexpected activity occurs at your home and an alert is sent to your smartphone, you have the option to ignore the incident, respond yourself, or have Scout alert a live operator who will call the police. 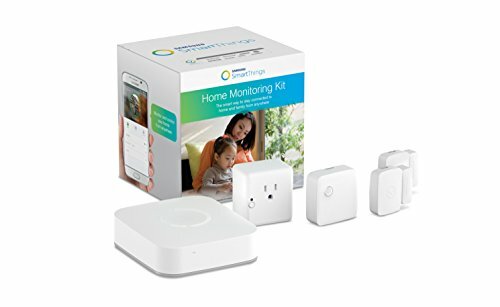 Below is a list of some of the popular products offered by SmartThings as well as what they can do for you and links to where you can purchase them. The Hub is the brain of your SmartThings system and is required to add devices. This device monitors movement and alerts you of activity when you’re away. You can also connect lights to it, so lights turn on when motion is detected. This is similar to a door/window sensor but can also be used on cabinets or garage doors. Plug your lamp, coffee maker, or other appliance into this smart switch so you can control when they turn on and off from anywhere. This key fob sensor alerts you when people or pets have left or arrived home. Attach it to your keys, your dog’s collar, or your child’s backpack. You can set rules for the thermostat, lights, and other devices to adjust when someone returns home. The SmartThings camera sends you motion and audio alerts when you’re away. If you want a SmartThings thermostat to adjust the temperature while you’re away, you can integrate ecobee3, which is one of our picks for best Wi-Fi thermostats. Starter kits include the Hub and most likely a few of the devices you want in your home automation system. Depending on your goals, you may be more drawn to one kit over the other. For example, if you mainly want to use SmartThings as a security system for your home, the Monitoring & Security Kit would be a good option. If you want to take advantage of more of the techy automation features, you might lean toward the Convenience & Entertainment package. Getting a starter kit can be less expensive than buying each sensor individually. If you purchase a starter kit and then build off of it, you could save around $20, depending on which kit you go with. Aside from saving you some money, the nice thing about starter kits is that you can add devices to it whenever you want. You don’t have to worry about purchasing a starter kit and all of the sensors up front. You can take time to get used to your system so you can get an idea of what other sensors you’d like to help automate your home. A starter kit may be enough for you if you live in an apartment or want to automate only one area of your home. For example, if you want to adjust the lighting to different modes for entertaining, you may want to purchase the Convenience & Entertainment Kit and use it to automate the lights in your living room. But if you want to automate multiple rooms in your home, you’ll probably need to purchase some additional sensors. We reached out to SmartThings customer service via email with some questions and received a response within two hours. We were very impressed with this response time. On top of that, the representative thoroughly answered our questions, and they even gave us some tips. For example, we asked about the number of devices that could be connected to one Hub, and they said there is no limit, but you’ll want to make sure the devices are within communicating range of the Hub. The representative made us feel like they were invested in making sure we had a positive customer experience, which was refreshing. What are customers saying about SmartThings? SmartThings gets great feedback on how easy it is to set up, and customers like that it’s compatible with numerous brands and devices. The complaints mostly revolve around app errors and connectivity issues. Would we recommend this product to you? SmartThings is our #1 pick for best home automation, and we would definitely recommend it to anyone. SmartThings has a huge developer community and is integrating with more and more products. The system is easy to use, so you don’t have to worry about being the most tech-savvy person. Plus, if you do have questions, customers have had a great deal of success with SmartThings customer service and community. 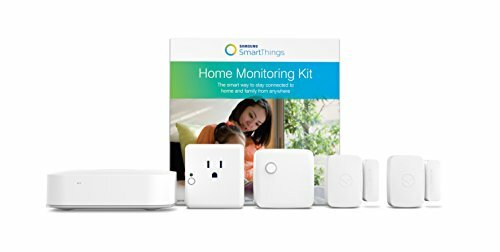 What would you use SmartThings for?